Imagine living just a mile from the James River, but never visiting any of the access points that line its banks – or even knowing that the river exists. 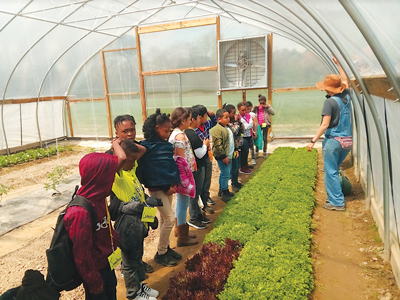 Many of the children from Richmond’s East End neighborhoods – an area with a poverty rate three times higher than the state average – have rarely experienced the natural beauty just beyond the fences of their asphalt block. While many families might take it for granted to pop over to Pony Pasture or Belle Isle to soak in the sights of the waterway that has become the heart of RVA, not everyone experiences this ease in accessing nature. Sadly, young people are becoming less likely to engage in the outdoors. National studies report that children are spending half as much time outside today as they did twenty years ago, with little or no unstructured outdoor play. Locally, surveys reveal lack of transportation as one of the main barriers inhibiting lower-income families from visiting the James. Blue Sky Fund believes the outdoors should be a part of every child’s life and works to provide transformative experiences in nature to urban youth across Richmond. Time spent in nature is proven to support the positive development of at-risk children by cultivating enhanced cooperation and conflict resolution skills, along with increases in self-esteem, problem-solving, and motivation to learn. the outside world while also learning about themselves. For a few weeks at a time, students are immersed in a new outdoor activity – such as hiking, biking, rock climbing, or kayaking – that challenges them to overcome fear and adversity while developing resiliency, a key factor in conquering adverse childhood events (ACE). 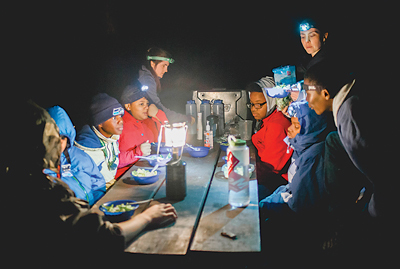 Each activity series culminates with an extended outdoor expedition that allows students to practice newfound skills in the environment and feel a sense of accomplishment in mastering an activity. Blue Sky Fund’s Outdoor Leadership Institute (Hannah’s program) guides high school students in becoming inclusive and service-oriented leaders in their community. 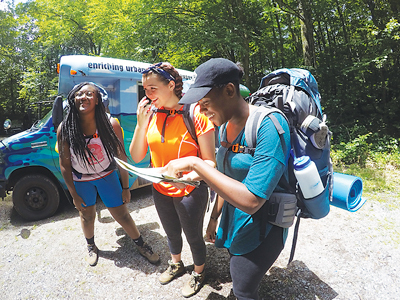 Students are nominated by a member of the community to participate in this yearlong program, which brings together a diverse group of students from high schools spanning the city to undergo team-building bootcamp before executing a 5-day excursion to Mount Rogers, the highest peak in Virginia. After completing the climb, students reconvene once a month throughout the school year to complete a service project in the community, such as planting trees, picking up trash, or recycling oyster shells for the Chesapeake Bay. Hike for Kids and Support Blue Sky Fund! Saturday, October 27, 9 a.m. 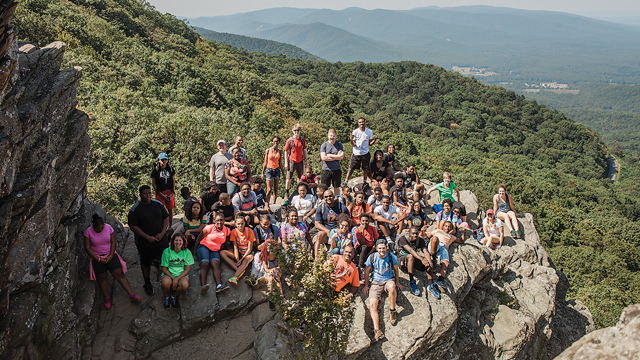 Hike along the James River Park System to support the urban youth served by Blue Sky Fund. Enjoy the challenge of 3-mile (family-friendly! ), 8-mile, or 14-mile loops around Belle Isle and other trails along the James River, each starting and ending at the Virginia War Memorial. Enjoy unforgettable river views and the crisp autumn air while hiking for a good cause. Celebrate the end of your hike with beer, food, and family festivities. 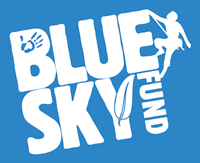 To register for the event or learn more about how to support Blue Sky Fund, visit BlueSkyFund.com. RFM readers can save $5 at online registration with the code: RFMH4K. Previous articleHang on to this issue!